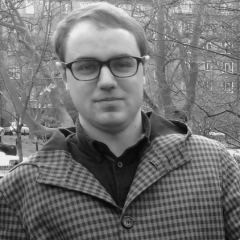 The Material Evidence exhibition website was just one of dozens in the pro-Kremlin network discovered by Alexander. “Material Evidence” is one of few pro-Putin Internet projects connected to Russia's “troll factories” with a significant offline trail. Because of this, we can trace its operations better than we can with other similar schemes. Pulling the threads of Material Evidence reveals that it has exploited and fooled several individuals in its efforts to promote itself. A touring exhibition of photographs and artifacts focusing on recent events in Ukraine and Syria, Material Evidence's imagery placed heavy emphasis on violent clashes during the Euromaidan protests, particularly on the supposed extreme-right elements in the movement. The show debuted in Moscow as “ВеЩдоки” [1 2, an abbreviated Russian portmanteau for Material Evidence], where it claimed to have the support of the Moscow Department of Culture and Russia's Syrian Embassy. 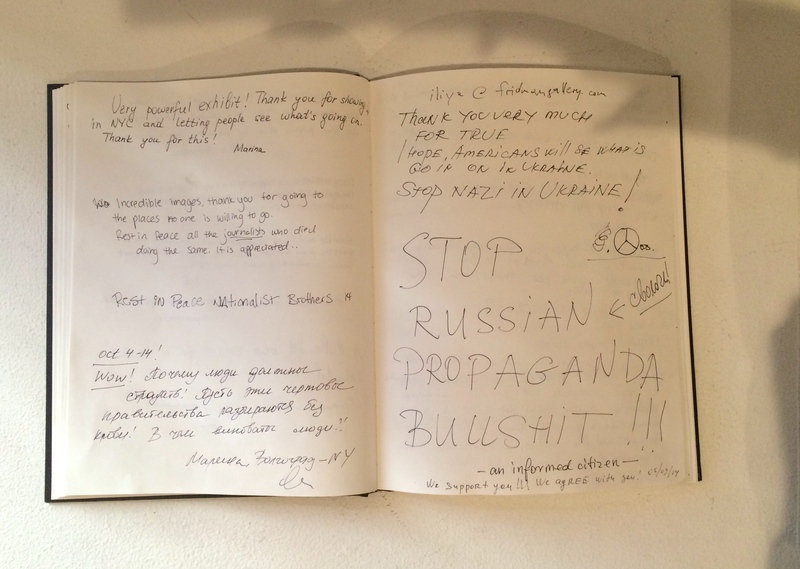 The exhibit then moved on to Europe and the US, where it drew allegations of pro-Kremlin propaganda and “astroturfing,” both from journalists and from some skeptical visitors. At least one observer questioned the statistical validity of the infographics on display. It was in May 2014, Hiller told RuNet Echo, that he was first contacted by Alexander Zhitenev, who was then acting as “manager” of the Material Evidence project in Moscow. Zhitenev was looking for “a proper curator to enhance the exhibition”—someone with a recognized journalistic background. A month later, in June (and despite some early reservations about the show's stance toward Syria and Ukraine), Hiller took on the job. WHOIS records show the English-language Material Evidence website was registered at exactly this time. In a previous interview with Adrian Chen for the New York Times Magazine, Hiller claimed that the touring art show's costs were covered by crowdfunding. Having found no trace of Material Evidence on any of the leading crowdfunding sites, RuNet Echo asked him to elaborate. Zhitenev claimed to Hiller that it was his wife who brought him into the role, which her work colleagues at an “advertising agency” were seeking to fill. RuNet Echo wasn't able to find information to confirm this, and Zhitenev did not respond to our request for comment. As Material Evidence began to promote itself around New York in the autumn of 2014—employing an extensive ad campaign—allegations of political bias began to emerge. One article by Ukrainian singer and activist Ruslana pointed to the strange use of the name Svetlana Zakharova, a patriotic Russian ballerina, as the registered administrator of Material Evidence's website. Spotted along with it was the e-mail address of one Nikita Podgorny—the crucial detail that provided a link between St. Petersburg's Internet Research Agency and the pro-Kremlin web network in an earlier RuNet Echo investigation. 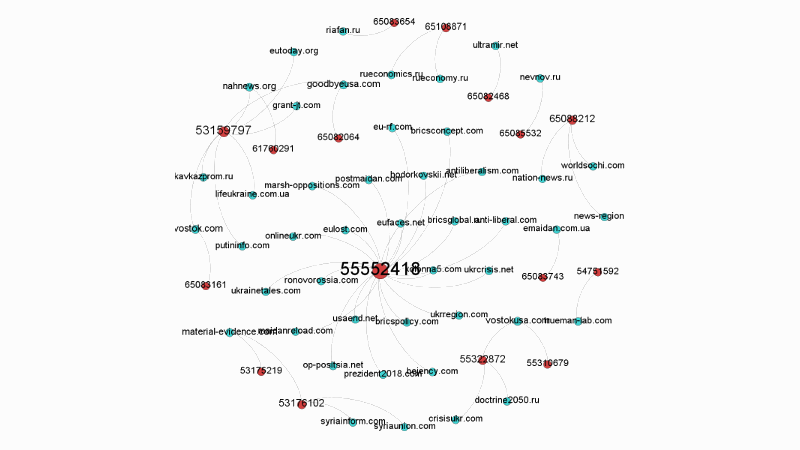 The timeline of Material Evidence's appearance in Europe and the US matches periods of peak activity in the wider pro-Kremlin website network. Domain registration dates show that just over half of the 84 sites identified to date were created between May and August 2014 (as seen in the interactive graphic of the registration date distribution below). The geopolitical focus of Material Evidence—on rebellion and protest in Ukraine and Syria—is also strongly reflected in many of the websites in the network, notably Syria Inform, Syria Union, and Emaidan. The now inactive Russian exhibit website вещдоки.рф (veschdoki.rf) was created in December 2013, presumably to further promote the project, but it seems no content was ever added to it. Records show that four other sites had been hosted on its server (1 2 3). One of them, nation-news.ru, features in the wider pro-Kremlin network. Another is Material Auction, an incomplete skeleton site bearing the Material Evidence logo. It was registered under Hiller's name shortly before he left the project in February 2015. An e-mail address, benjhil@yandex.com, also appears in its domain records. But Hiller denied any knowledge of the site or the Russian Yandex address, citing it as another example of how the project had acted dishonestly towards him. I guess Kashin addressed the consequences. Global Voices show how this is done by the state and its agents. Why don’t you write about USA state founded agencies also?